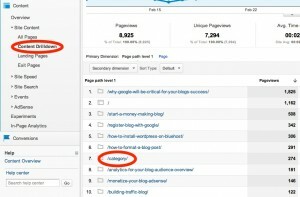 For those of you that might just be coming into this series on Google Analytics for your blog, this is the third article in a series. Part one provided an overview of Google Analytics along with diving into the audience overview section. Part two discussed the Traffic Sources section of Google Analytics. In this third part of the series, we’ll explore the details of the Google Analytics Content section which allows you to view metrics data for the actual content of your blog or website. The content section includes a large number of sub-sections and data, which makes for a big article. You might want to consider bookmarking this article for future reference. 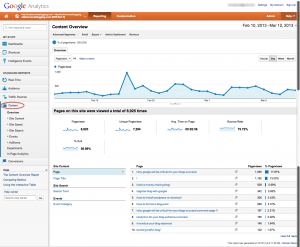 The Content Section in Google Analytics provides metrics about the specific content pages on your blog or website. This includes tracking and showing the most popular pages on your site, showing bounce rate by content page, and a number of other metrics specific to individual pages. You can also view information about landing pages and exit pages, so you can see where visitors are coming into your site, and on which pages they are leaving from. The Content Section additionally includes Site Speed for performance metrics, detailed metrics on Google Site Search (if you’re running it), Events, Adsense , Experiments, and finally in page Analytics. Just a reminder, that the data shown here is only for the selected time period in the upper right hand corner. You’ll need to adjust the date range based on the timeframe you want to see. For example, if you wanted to see the rankings of your content for the entire life of your blog, you would need to adjust the start date to the start date of your blog to present day. You can also change the number of pages shown by clicking the “Show Full Report” link in the bottom right. This is the same as clicking the “All Pages” link under Site Content. Clicking on an individual page will take you to a Content Overview page only for the page selected. This view allows you to see metrics specific to a page. I often use this to see the bounce rate at an individual page level so I can tweak particular pages to reduce bounce rate. Site Content, just below the Overview page offers additional options for viewing information about your site’s pages. All pages will show you the Content Overview page, but for all pages on your site. This page is a little misleading. On the surface, it looks the same as the Content Overview page; however if you pay particular attention, you’ll note a few differences, namely the small icons next to each of the pages listed. The content drilldown page shows activity at a folder or directory level, not just at the page level. In general for most blogs, this won’t be incredibly useful, but it can be depending on what you’re trying to see. In the screenshot below, I’ve circled one of the “folders” on my blog, \category\. Category is the parent folder for all category pages on my blog. Viewing this data shows me how many people have viewed category pages as a whole on my blog. I can then click on category and see the breakdown below that, which of course would be my individual categories. This view would also be very useful if you have nested pages (parent/child pages) set-up in WordPress. I personally don’t use nested pages, but a number of my clients do for various reasons. Determine which pages are serving as the “first” view of your website. These pages should be optimized to include more links into your site and provide introductory information about your site. You’ll also want to make sure these pages are error free and render correctly on mobile and in all browsers. First impressions count! Determine how well each each of these pages is performing and retaining visitors. Is the bounce rate high? Add more in article links and more options for exploring other parts of your site within the article and in the sidebars. If visitors aren’t staying long, you might want to consider revising your content or refreshing it to make it line up more with what visitors are looking for. Just as you would expect, the exit pages view shows you the pages that people leave your site from. These pages should be used to determine which pages to focus on for conversion or to drive people deeper into your site. Conversion meaning selling something. If you sell products (like eBooks) on your site, the exit pages report can be used to determine on which pages you should focus your eBook sales efforts. Honestly, this is not a report I use often, as I don’t currently offer or sell any products. But I plan to. Over the past 2 years, Google has made it very clear that site performance factors into their search engine rankings and the overall score they give your blog. Given that, making sure that your site performs well is critical. The Site Speed section of Google Analytics provides you with performance information for your blog and its individual pages. Avg. Page Load Time – Average amount of time for pages to load. This is the total time spent starting with the page request to being fulled rendered in the browser. Your target number here should be 3-5 seconds, and anything over 7 seconds is too slow. Avg. Redirection Time – Average time for any site redirection to occur. If you don’t use redirection, this value should be 0. Avg. Domain Lookup Time – Average time for a DNS lookup to occur. A DNS lookup is the amount of time spent looking up your domain name, and determining the actual end server to direct the request to. Avg. Server Connect Time – The average amount of time spent establishing a connection to your web server. If you have a good hosting company, this number should be low. I host with A small Orange (affiliate link), and as you can see, my average time is .04 seconds – really good. I see this number above 1 second for less expensive hosting with many of my clients. A second is really too long considering on average your entire site should be fully responding within 3-5 seconds. Avg. Server Response Time – The average amount of time for your web server to respond, including network transport time. Again, you want this number low – definitely less than 1 second. Avg. Page Download Time – The average time to actually download the page. This does not include rendering it in the browser. The real key number you should focus on out of all of these is Avg. Page Load Time, because that is the real time your visitor/readers see. The other numbers can often add insight into where your slowdowns occur. Below these summary numbers, Google Analytics also shows you the Avg. Page Load time by browser. If you look at my numbers, you’ll see that Chrome renders pages significantly faster than both Internet Explorer and Firefox. As you can see on the graph in the screenshot, some of my Avg. Load Times are slow. The primary reason for this is due to backups running on my site and also due to MediaTemple scheduled maintenance work. The slow times are minimal and are during off hours, but do skew my average up. Overall, my site responds in about 3.5 seconds on average. I’ve recently made some caching tweaks to bring the overall numbers down. I’m very happy with a sub 4 second number. As the name implies, page timings just shows you performance numbers for individual pages on your blog. The pages are sorted by Pageviews by default. This section provides useful data on determining which of your pages are performing well vs. poorly and allows you to identify and tweak slow pages. Individual pages could be slow for a number of reasons, but a I’ve common reasons are: incorrectly sized images, slow ads or slow affiliate offers specific to the page. The sections below are not sections I use in Analytics. I am familiar with them at a high level, but have not spend much time understanding or using them. I’ll share what I know for overview purposes and will link out to places where you can learn more information. User timings allow you to track user times for specific actions being taken on your blog. I don’t currently use user timings and it requires special set-up and installation of specific Google Analytics tracking script to work. 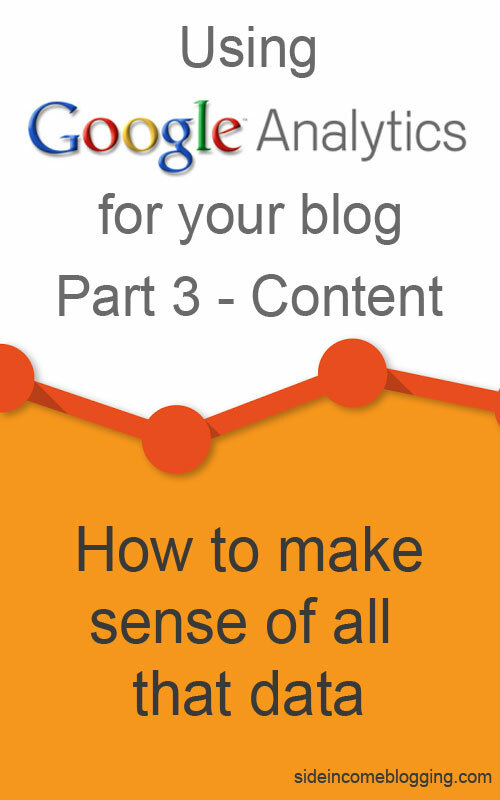 If this is something you are interested in using, you can find more information on the Google Analytics blog. Site Search allows you to track analytics data for Google CSE or Site Search on your blog. I just recently added Google CSE as the search engine for my blog and haven’t yet set-up the site search integration. Once I do, I’ll update this article with the details. The meantime, you can read all about how it works on the Google Analytics blog. Events allow you to track user interactions with your site that can be tracked independent from a web page on your site or screen load. Examples of these are: Downloads, mobile ad clicks, video plays, etc. This is not something I currently use nor am I very familiar with, thus I won’t go into any further detail on it but you can read more in Analytics help. 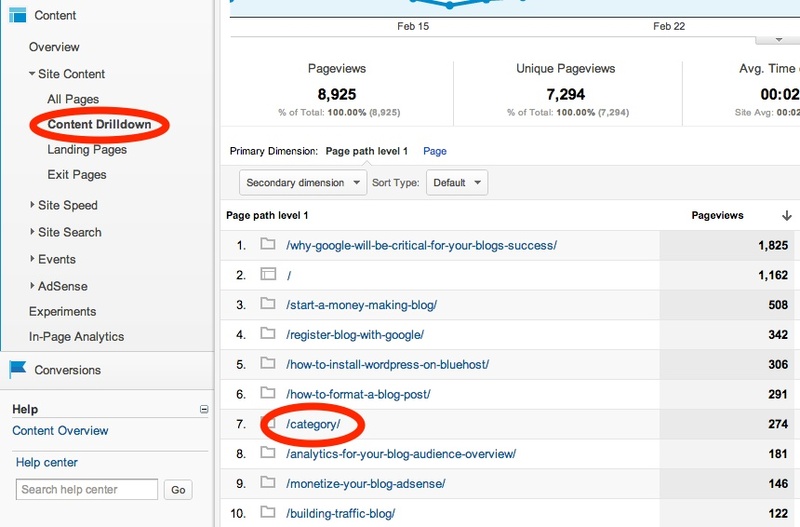 If you run Adsense ads on your blog, you can set-up Google Analytics so that it integrates with your Adsense Account. This is done through your Adsense account settings. I am not running Adsense on this blog currently, so I don’t have any beneficial data to show. Even if I did, disclosing Adsense income and associated data is a touchy subject with Google and often against the Adsense Terms of Service, so I wouldn’t be comfortable showing any screen shots as well. But, as you would expect, the Adsense section provides you with metrics on your blog or site’s Adsense income both at a summary level and on a per post level so you can see what pages on your site are earning the most money for you. If you run Adsense on your site, I would highly recommend you set-up this integration and use the data in this Analytics section. 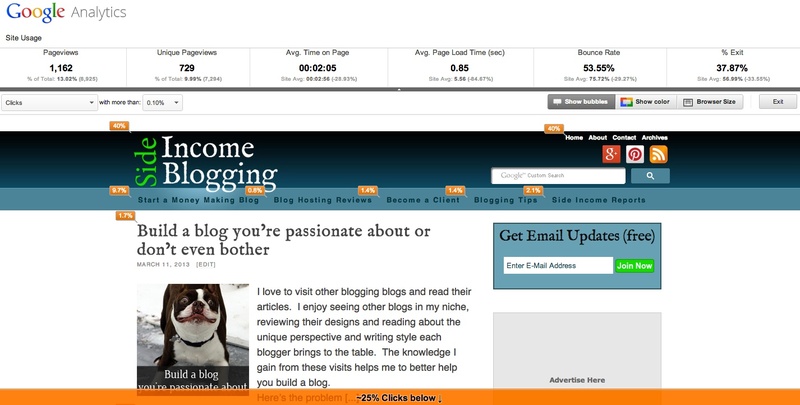 Google Analytics experiments allow you to test various landing pages on your blog or website. Using experiments you can test which pages have the highest bounce rate and which have the highest conversation rates. Again, I have not used this feature yet, but understand from others that have, that it is a pretty powerful feature for those of you focusing on landing pages and conversations. You can read more about Google Analytics experiments here. If you’re a visual person, you’ll love in page analytics. I tend to be more data oriented, but I do like to see visually how the clicks on my site area spread out and where most of the clicks occur. I don’t think In Page Analytics as effective as CrazyEgg for determining how and where people post actively use your site, but it does provide some free and quick data. I really suggest you play around with it and see what you think. 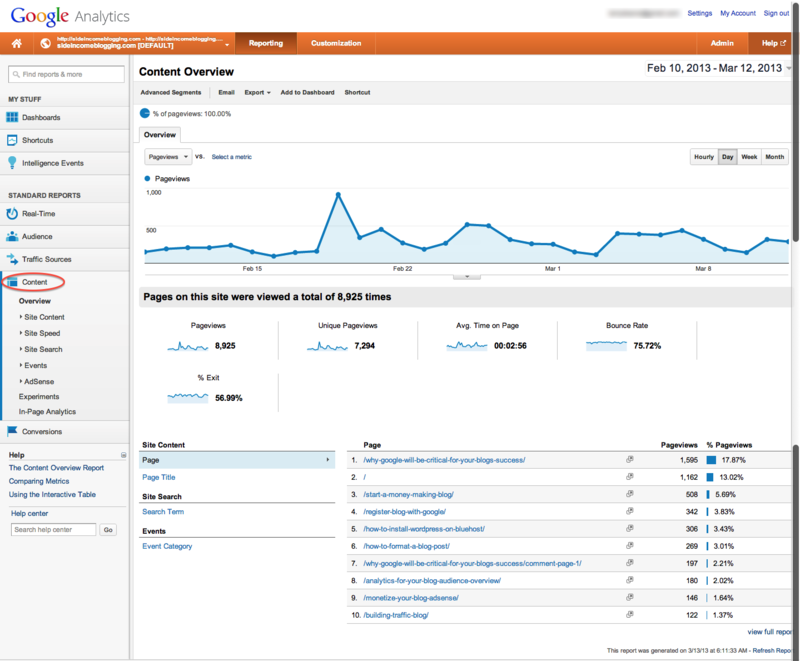 That wraps up the overview of the Google Analytics Content section. This was a big one, but I really hope the overview gave you some additional insights and made Google Analytics feel a little less overwhelming. The next and final article in this series will tell you how to use all of this data to make your blog better.